Henry Purdy is tackled by Alex Lewington, who scored a first-half try for London Irish. Matt Kvesic and Billy Burns scored second-half tries as Gloucester came from behind to beat London Irish. James Hook's early penalty was cancelled out by Ciaran Hearn who broke a Bill Meakes tackle for an easy score. Hook struck again before Alex Lewington collected a Chris Noakes kick to give Irish an eight-point lead at the break. But two second-half penalties from Hook, and tries from Kvesic and Burns completed the turnaround as Gloucester denied Irish a second consecutive win. The Exiles last beat Gloucester on 5 January 2013, when they won 18-12 at Kingsholm. The Cherry & Whites have now won five on the spin. On a gloomy afternoon in the Kingsholm mud, the home side opened the scoring through Hook's penalty following a good driving maul from their pack. But London Irish were gifted an easy try when Bill Meakes' missed tackle let in Ciaran Hearn, who danced his way over the line from five metres before Chris Noakes converted. Hook added a second with a good long-range effort, before an extended period of aerial ping-pong followed, during which neither side managed to take hold of the game. In slippery conditions, Gloucester struggled to defend a powerful Irish drive, and the visiting forward pack provided a good platform for their backs who executed a superb second try. Noakes' deft cross-field kick was collected by Lewington to allow the visitors to enjoy an eight-point lead at the break. But Gloucester came out fighting in the second half and another clean kick from Hook narrowed the deficit to five points, before London Irish were reduced to 14 men when Lewington was awarded a yellow card. The Cherry and Whites were denied a try by the TMO in the same incident and, after a period of pressure, they opted for the points from Hook. Gloucester took the lead with just over 20 minutes to play through Hook's fifth penalty. Jeremy Thrush had been superb at the line-out all game, and the Gloucester pack drove over the line for Kvesic to touch down, Hook converting. The home side then scored again following a good break from Billy Twelvetrees, who offloaded to Burns to cross with his first touch of the game. 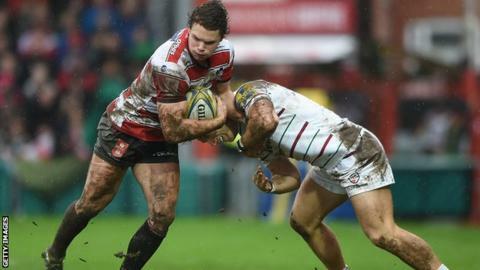 Hook was unable to convert with his first miss of the match, but Gloucester held on to record a key victory. "Despite the interval scoreline, there wasn't a huge amount between the teams. Irish took their two opportunities well but in those conditions, it's almost better not to have the ball. "It became an arm wrestle but we never felt under massive pressure and full credit to Charlie Sharples and Henry Purdy, who relentlessly chased kicks. "Our second-half performance was outstanding and one of our best of the season as we had to roll up our sleeves to ensure the win." "It would have been nice to get a bonus point as we had parts of the game under control but ill-discipline in the second half really cost us. "The penalty count in that half was 10-0 against us and it was difficult to play with those figures in those conditions. "They used the maul very well and the pressure told. Losing Alex Lewington to the sin-bin didn't help as going down to 14 men is never easy." Gloucester: Cook; Sharples, Meakes, Twelvetrees (capt), Purdy; Hook, Heinz; Wood, Hibbard, Thomas, Savage, Thrush, Moriarty, Kvesic, Kalamafoni. Replacements: Lindsay, Murphy, McAllister, Morgan, Rowan, Laidlaw, Burns, Atkinson. London Irish: Maitland; Lewington, Hearn, Williams, Tikoirotuma; Noakes, McKibbin; Court, Paice, Franks, Symons (capt), Lloyd, Narraway, Cowan, Treviranus. Replacements: Ellis, Smallbone, Aulika, Sinclair, Trayfoot, Steele, Geraghty, Ojo.